Both Instagram and Snapchat are adding new features to prompt increased voter participation in the US mid terms - and with statistics showing that younger people are less inclined to get out and vote, their efforts could have a significant impact. "Starting Sunday, you’ll be able to use a new “I Voted” sticker. Open the camera, take a proud selfie, tap the sticker icon and select the “I Voted” sticker from the tray. If your phone language is set to Spanish, you’ll see the “Yo Voté” version. After you use the “I Voted” sticker, your friends can tap the sticker in your story to find their polling location via Get to the Polls, a nonpartisan site." "On Election Day on November 6th, you will see a “We Voted!” story at the front of your stories bar when several of your friends post a story with the “I Voted” sticker. Simply tap the “We Voted!” story to see your friends’ voting excitement all in one place. This functionality is new to Instagram, and provides a way for you to see the people you follow share a moment together in Stories. We’re excited to bring this feature to the community in new ways in the future." For starters, this is interesting in that it's a new functionality within the app. The capacity to build entire new stories based on usage of a selected sticker opens up a range of additional considerations for future public stories, and even branded stories content. For example, rather than tagging a brand, you soon might simply be able use a brand-created sticker - the brand would then be notified of that usage, and would be able to coordinate such into a new story and highlight on their profile. But more importantly, from a voter participation perspective, this form of peer sharing can be highly effective in encouraging others to vote. How do we know? Because Facebook has conducted a test of the same previously - back in 2010, around 340,000 extra voters turned out to take part in the US Congressional elections because of a single election-day Facebook message which, essentially, used a similar form of peer pressure to prompt increased participation. 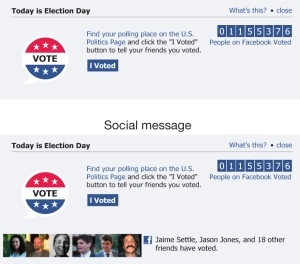 The results of the test showed that users who received the informational message (the top message in the above image) voted at the same rate as those who saw no message at all, while those who saw the social message - with images of their friends included (lower example in above image) were 2% more likely to click the 'I voted' button, and 0.4% more likely to head to the polls than the either group. Based on this, researchers estimated that the social message directly increased voter turnout by 60,000 votes, while a further 280,000 people were "indirectly nudged to the polls" by seeing messages in their News Feeds - notifications that their friends had voted. This shows that the participation of people you know can impact your own motivation to get involved - Facebook already knows this based on the research, which is why the new 'We Voted' Stories initiative could be particularly powerful. Over on Snapchat, Snap's also rolling out a range of election day stickers and Lenses to encourage users to share their activity. 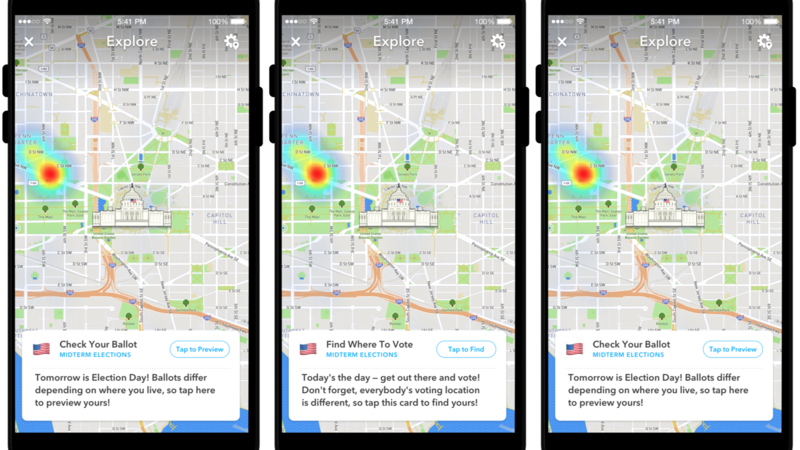 In addition, Snapchat will send a video to all 18+ users in the U.S. reminding them to vote, while it's also adding polling locations to Snap Map. As noted, given the historically low voter participation rates among younger groups, both Snapchat and Instagram can play a significant role in changing the outcome in the US mid terms. Both apps predominantly skew young. so it makes sense to see increased focus from them in encouraging user action - Snapchat says that more than 400,000 of its users have already registered to vote as a result of its recently launched voter registration feature. It'll be interesting to see whether social media is considered a factor in the mid terms. Obviously, Facebook has come under fire for its perceived role in the 2016 Presidential Election (as has Twitter to a lesser degree), but its difficult to say exactly how significant that influence has been. This time around, you can bet that election analysts will be viewing social media influence more carefully, and if there's a big shift in younger voter participation, you can imagine that it will be efforts like these that stand out as key factors.